Visiting museums and historical sites sounds like something people do while on vacation. But the folks at the Manatee County Agricultural Museum in Palmetto want area residents to know their local museums are fun places to visit anytime. To spread that message, the agricultural museum at 1016 Sixth St. W. in Palmetto will hold the second in a series of four Ag at Night adults-only events at 7 p.m. March 27. “It’s a broad topic but it’s focusing on an agriculture subject historically and how it is relative today,” Morgan said. Guests will have a chance to visit several information tables located throughout the museum. There will be tasting stations, some hands-on activities and some demonstrations, all dealing with produce grown in Manatee County. Morgan said according to a 2011 Florida Department of Agriculture and Manatee County statistic that Manatee and Hillsborough counties produce about 40 percent of the tomatoes grown in Florida. 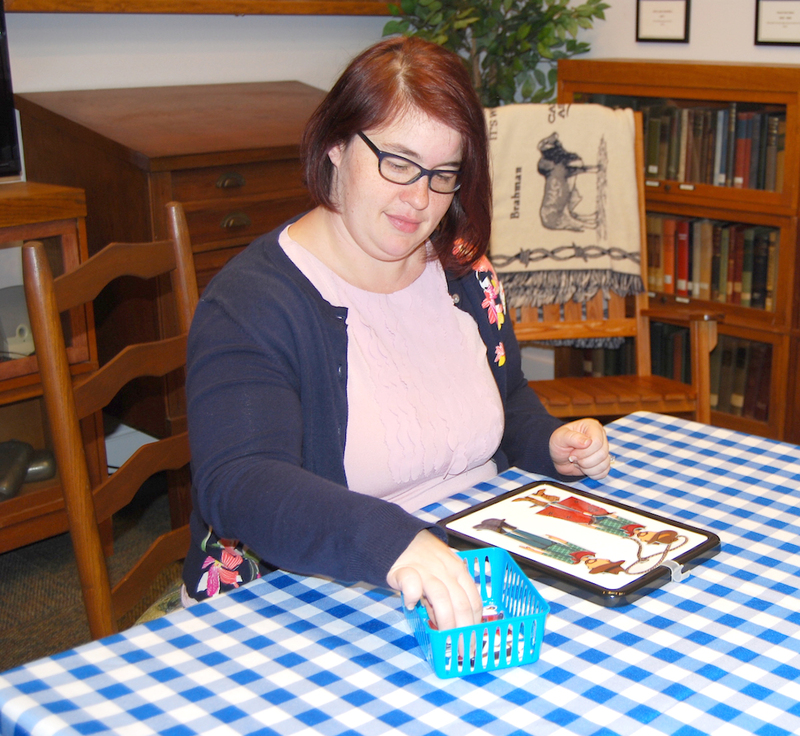 Melissa Morgan, curator at the Manatee County Agricultural Museum in Palmetto, demonstrates a hands-on project used at the Ag at Night event held in January at the museum. “There’s a very strong history of agriculture in Manatee County,” she said. “Museums are important to record and preserve the story of our county. “You don’t have Manatee County without agriculture,” Morgan said. Several local business owners will be participating in the Ag at Night event. At one tasting station the museum will be partnering with Geraldson Family Farms. They will have several tomato varieties they grow on their farm in northwest Bradenton. “There are so many more varieties of tomatoes than what you usually find in a grocery store,” Morgan said. Geraldson’s Family Farm in northwest Bradenton will have a tasting table where Ag at Night guests can sample several varieties of heirloom tomatoes, such as the yellow and Roma. Burness said the guests will not only taste the difference, but they can see the difference. At another station there will be a blind tasting test of orange juice. “You have to figure out which brand is which,” Morgan said. ”Of course Tropicana will be one of those brands. “We’ll also take a poll on pulp or no pulp in your orange juice, she said. “People have strong opinions about this. “We’re only taking the poll because it will be fun,” Morgan said. One of the hands-on activities will be planting an herb garden in a Mason jar that participants get to take home. “When we have school field trips here, most involve a planting station, and we wanted to have one because the event is about planting and produce,” Morgan said. Those participating at Ag at Night will have a chance to design their own citrus crate label. They will be given a general outline of a label and then they can add their personal touch, such as a name or palm trees. Jim Thielen, a local produce crate label collector, will be on hand at that station to share the history of crate labels and talk about the labels used in Florida. What the activity will be is not completely formulated yet, she said. Participants may be asked to fill a bucket or harvest bag with produce, then pick it up and carry it a short distance to help understand what a farmworker has to do in the fields. Because the evening event is self-paced, participants will spend about 5 to10 minutes at each station. All of the stations will try to work with an exiting exhibit, such as the farmworker exhibit that was put up in November. Ag at Night guests will also have a chance to view two exhibitions still on display – Moonshine in Manatee and the East & West Art Show. “They both close at the end of March, so this may be one of the last times to see them,” Morgan said. A picking bag used by farmworkers is on display at the Manatee County Agricultural Museum in Palmetto. The first of the Ag at Night series with the theme of “Adventures in Cowhunting” was held Jan. 30, and participants learned about the legendary cowhunters of Florida. There was a hands-on activity where participants dressed a paper doll-type photo of two men with articles of clothing showing the difference between a Western cowboy and a Florida cowhunter. Local cattleman, Jason McKendree, who works for Triangle Ranch in Myakka, and his son Jake were at the January event to talk about raising cattle in Florida. Jake, now 11, won first place in the whip-cracking competition at the Manatee County Fair when he was 6 years old. Also that evening, another life long cattleman, Cully Rowell, who has used brands all his life, talked about cattle brands and how they are used and why. “We had a good turnout that evening,” Morgan said. After the March 27 event, two more Ag at Night events will be held, “Homesteading in Florida” on May 29, and “Plants and Pollinators” on July 31. The “Homesteading in Florida” event will look at what kind of skills were needed to survive after moving to the wilds of Florida in the mid-1800s. Exact plans for the Ag at Night event in May are still being developed. “We’re hoping to talk about quilting and fabric, explain the difference between cotton and wool and how one has to be grown and the other is produced,” Morgan said. The Lundy moonshine still is one of the exhibits visitors at the Manatee County Agricultural Museum in Palmetto can see during the Ag at Night event March 27. Wool never was very popular in Florida, she pointed out, because people didn’t want to wear the fabric here with the hot weather. The museum staff is continuing to develop the program for the May and July events. The theme for the July Ag at Night will be “Plants and Pollinators,” and the program will focus on activities dealing with the significance of maintaining a native Florida plant environment. The program will include something about bees, one of the major pollinators. There will also be discussions about other types of pollinators, such as bats and butterflies. Ag at Night is a unique experience for people18 and older and was developed for adults. “We’ve been wanting to do an adult program for awhile,” Morgan said. “We do a lot of children’s programs. Morgan said they were looking to attract Millennials and the Gen-Z crowd with this program. Tickets can be purchased on Eventbrite.com, and are $8 for members, $10 in advance, or $15 at the door. 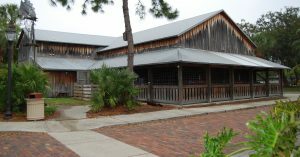 Links to Eventbrite.com can also be found on the museum’s website, www.manateecountyagmuseum.com, or their Facebook page. Purchasing of tickets early is recommended since there are a limited number available. There will be snacks and light refreshments served. 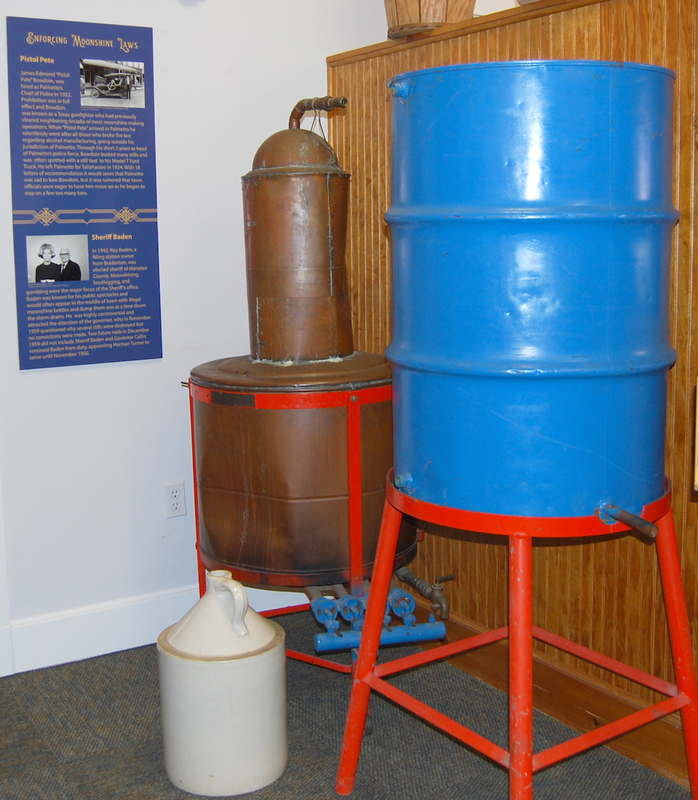 For more information about Ag at Night or the Manatee County Agricultural Museum, check out it’s website or Facebook page, or by email, at agriculturalmuseum@manateeclerk.com, or call 941- 721-2034.